CLE Cigars have been traditionally made in Honduras, but founder Christian Eiroa wanted to try something new. CLE Prieto hand-rolled premium cigars are created individually in Nicaragua … but there isn’t a single leaf of Honduran tobacco in the Prieto blend. Instead, this CLE line of high-quality handmade cigars are infused with Nicaraguan long-fillers and binders wrapped up perfectly inside a dark Maduro Connecticut Broadleaf. 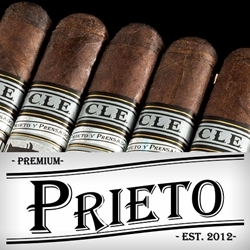 Flawlessly constructed and box-pressed, CLE Prieto premium cigars produce a medium to full bodied smoke packed full of robust combinations of flavors allowing for a slow burn with an effortless draw. CLE Prieto are hand-rolled premium cigars that make an excellent choice for any cigar connoisseur. Smokers Discounts has made it affordable and easy affordable to buy premium cigars online. A variety of sizes and flavors are listed below at our discount online cigar store. Each of these styles are in stock and available. Call us for more details!